DIY Christmas Table Décor Set containing tableware to dress up your Christmas table. Make a great impression on your guests this Christmas! Our Festive set of co-ordinated disposable table decorations is designed to be an easy yet elegant solution to set a Christmas table for 10 guests. The 'Joy' décor set combines a vibrant pop of festive red offset with clean white. 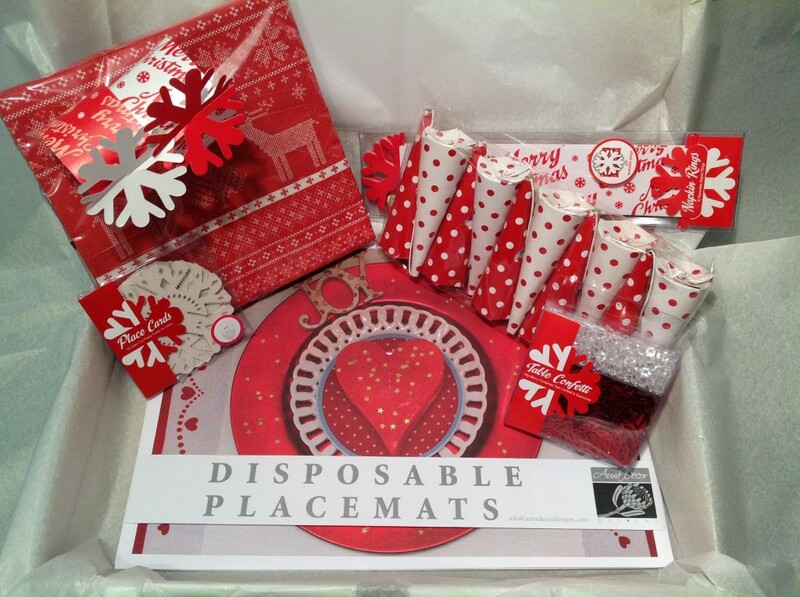 Each 10 piece box includes everything from fun placemats to table sprinkles and party poppers. Lastly, add some festive table lights from our LED lighting range and enjoy the festivities. What is in the Christmas Table Decor Box? Note: Design of individual contents may vary slightly from image shown, but will match the theme and colour combination.